A falconer is someone who hunts game such as pheasants and rabbits using trained hawks and eagles. There are two main types of falconry. In historical dramas, falconry is often seen as a leisure activity of feudal daimyo, who often have their own personal falconers who use the birds to hunt pheasants and ducks for sport. 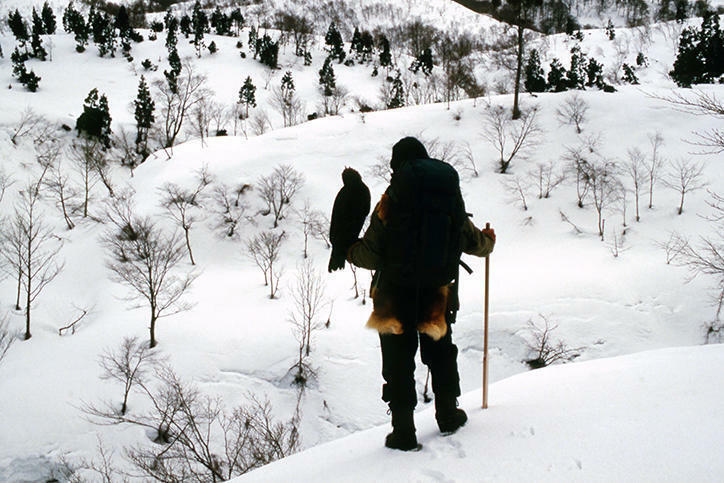 Another form of falconry was the winter work of mountain farmers in the Tohoku region, who trained mountain hawk-eagles and golden eagles to catch rabbits, foxes, raccoon dogs, and Japanese marten, whose fur they sell to supplement their income. 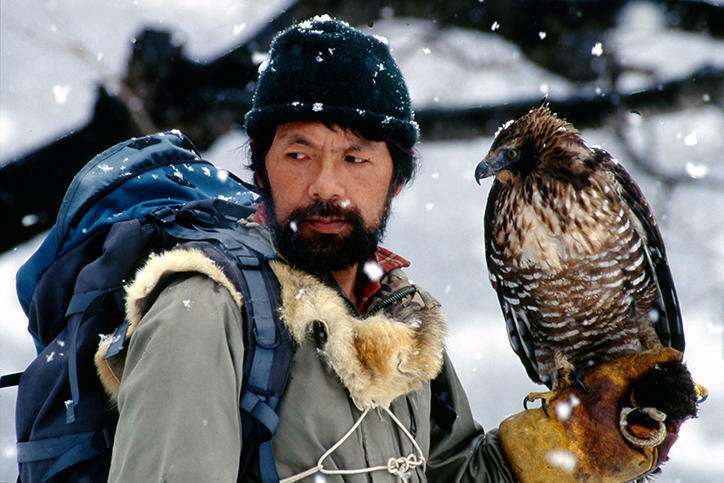 Hidetoshi Matsubara is currently the only falconer who still hunts with the mountain hawk-eagle. And since he has yet to find a successor, it is possible that he will become Japan’s last mountain hawk-eagle falconer. We sat down to discuss his decision to pursue falconry and where it has taken him in life. ―I would like to ask you frankly. Falconry seems like a fascinating job, but is the work consistent? It was in 1974 when I graduated from the Faculty of Letters and began studying under legendary falconer Asaji Kutsuzawa. He was 79 years old at the time, so he was no longer venturing into the mountains to hunt in winter. When he was younger and more active, the mountains were full of small animals in winter, and fur was sold at a reasonable price, so the work was consistent throughout the winter. However, as time went on, the number of animals gradually dwindled, and it became more difficult to sell their furs. New wildlife protection measures also made it harder to acquire mountain hawk-eagles, which in turn made it quite challenging to make a living out of falconry. And to be honest, when I first began studying with Kutsuzawa, I knew it would only get harder. And yet I’ve survived this far on falconry and continue to make it my life’s work. ―Despite your circumstances, what was it about falconry that made you want to pursue it? In a word, I loved the falconry lifestyle. It takes time to train a mountain hawk-eagle. Living together in a mountain hut, you have to get them used to perching on your arm. You have to train them to pounce upon prey, and you must feed them as little as possible in order to raise their motivation during the hunting season. It takes a long time and an enormous amount of patience before you can communicate with each other well enough to hunt together. But there is nothing better than being face to face with a bird. Including my first year of training, it took a total of four and a half years until my hawk-eagle caught its first rabbit. I still remember the endless tears of joy I cried as I stood there in the snow. The hardships were great, but the payoff was even greater. I was awestruck. I felt I had become one with my bird, my heart riding on its wings as it flew through the air. Seeing my bird soar toward its catch is still my greatest joy today. That one perfect moment makes all of the hardship worthwhile. For me, that is what makes falconry so unique and so special. ―I know you didn’t grow up in a farming household. What made you turn to falconry after graduating from the Faculty of Letters? Up until high school, I lived in the city of Aomori in northern Tohoku. When I was a child, we kept parakeets and finches, and I belonged to a wild bird society as well. Once, in junior high, I took my binoculars to go to see a white hawk that had been spotted in my classmate's village. Witnessing a gyrfalcon on Honshu is exceptionally rare. I also liked hiking and belonged to a mountaineering club, so even as a teenager, I was attracted to birds and mountains. Be that as it may, in high school I was obsessed with studying English and tried my best to be a serious student to get into a good university. I was able to pass the entrance exam for the Faculty of Letters at Keio. And though I belonged to the Keio Bird Watching Club, it was not enough for me to go bird watching on Mt. Takao and the mountains of Okutama, so I began to go on solo climbs of Japan’s Northern and Southern Alps. To save money, I would sleep outside, in a tent, or in one of the free emergency huts along the mountain trails. I would often be hungry since I traveled light, carrying as little food as possible. So when I ran into a snake, I’d catch it, skin it, and eat the meat, sometimes raw, sometimes cooked. Snake is actually quite good. I would eat birds and other animals as well when I could catch them. Thinking that I might be able to make some money by selling snakes to restaurants that cook weird stuff like that, one summer I brought back seven snakes—including a rat snake, a striped snake, and a forest ratsnake—from the mountains and kept them in a cardboard box in my room in Sendagaya. However, it became too much work to keep them from escaping, so they ended up just living in the room with me. One hot day when I was sleeping in my underwear, the snakes crawled on top of me, which felt cool and comfortable. I’ve heard that in the mountains of China, people do the same thing to battle the summer heat. On another hot day, there was a bit of a riot when one of the snakes got out of my room and startled the landlord’s daughter. Luckily I didn’t get kicked out of my room for that because the landlord thought the snake lost its way into the house from the woods of the nearby shrine. ―Let’s change direction. You took a year off after you finished your third year of university. Why? I majored in Asian History from my second year of university onward, but I was much more interested in stories of adventure than the old Chinese classics. I was enthralled by works like Sven Hedin’s Through Asia and Dersu Uzala, a story about a Siberian explorer, one that would later become an Akira Kurosawa film. My dream at the time was to single-handedly ride a camel across an uncharted desert. I did my research and took a year off to head for the Rub' al Khali, the largest contiguous sand desert in the world, located on the southern end of the Arabian Peninsula. At 800 kilometers across, I decided to walk from Tokyo to my hometown of Aomori, a journey of equal distance, to prepare. But I made a huge mistake when I tried to drink as little water as possible, figuring I would have little in the desert. A few days into my journey, I came down with a terrible bout of dehydration and abandoned my long walk home. Once I recovered, I walked back from Aomori to Tokyo. It took 20 days to walk, and I camped outdoors along the way. Once, I stayed in a farmer’s barn without permission. I was found in the morning after their dog began barking at me. They were either amazed or impressed when I told them that I planned on walking all the way back to Tokyo and ended up cooking me breakfast. Once I was back in Tokyo, I hurriedly put in my visa application to the Saudi Arabian embassy only to be discouraged to find out that I could only obtain a three-day tourist visa, hardly enough time to even get to the desert, much less cross it. In the end, I had to abandon my adventure before it even started. But I had already taken a year off school. I began to think about how I should spend it. I decided to fulfill my dream of living in the mountains, helping out as a farmhand for one year while living on the second floor of a silkworm farmhouse located deep in the Kitakami Mountains of Iwate. Surrounded by the mountains, I thought about my future career. I remembered The Old Man and the Hawk, a documentary I saw when I was in junior high school. The film follows the daily life of a falconer, and it even won an award at the Cannes Film Festival. The same strong emotions I felt as a teenager watching the film welled up in me, and I knew that the only work I wanted to do was falconry. I made up my mind to become an apprentice of Kutsuzawa, who had starred in The Old Man and the Hawk. The only other option where I could be in close contact with both the mountains and animals was to become a bear hunter, but I much preferred being a buddy to birds than to shooting a gun. And so I went back to attend my fourth year of university. In my remaining year at school, I tried to gain as much knowledge as I could on falconry. I read historical East Asian literature regarding falconry of the Korean peninsula and chose it as my thesis topic. I also thought about a short career after school to save some money before becoming an apprentice to Kutsuzawa. I got a job that I found through a newspaper ad, but when I considered Kutsuzawa’s advanced age, I decided to quit before I even started in order to begin my apprenticeship as soon as possible. I wrote him a formal letter of request, which he promptly denied. Even still, I went to see him several times, but to no avail, until he finally agreed to accept me as his apprentice as long as I had parental consent. And so I went home to Aomori. My father was a banker, and my mother was an elementary school teacher. Neither of them knew the first thing about falconry. I announced my intentions to become a falconer without giving them the first chance to say otherwise. And so my apprenticeship began. My parents had to have been anxious about my decision, but they later gave me their support. Ever since, I have lived as a falconer, even through complicated legal issues and personal relationships that have been significant barriers to success. I’d like to give myself a pat on the back for choosing this path in life despite its hardships. I currently have no apprentice or successor. I may be the last falconer who trains the kumataka, the Japanese mountain hawk-eagle. If there should happen to be a young person who wants to learn hawk-eagle falconry, I would be willing to teach them the trade. But I doubt that person will ever appear, especially since they would have to travel an even rockier road than I. ―On a related note, you climbed mountains abroad even after you became a falconer. What did you do with your bird while you were gone? Once I was married, my wife was able to help with feeding, so I was able to take longer mountain treks during the hunting offseason. My wife originally worked for a bank in Osaka, and we met when she got lost on a trip to Mount Bandai during her summer vacation. After a long-distance relationship, we married and had a son, though her family strongly opposed our marriage. It was only natural that they didn’t approve. At the time, we lived in a mountain hut without gas, electricity, or running water. In the winter, we would melt ice on the stove to make water. After I married, I joined an expedition from Yamagata to make the first ascent of a remote peak located in the Kunlun Mountains in China. I also tried first ascents of mountains in Tibet but was unable to summit them. I have also completed solo climbs of four peaks in Peru over 4,000 meters high. I love mountain climbing to see the diverse wildlife that inhabits them. ―Could you say a few final words to current students? Even if your dream doesn’t lead to financial success, if it’s what you really want to do, then do it. If people tell you there’s no future in what you want to do or say that it won’t make any money, you don’t have to listen to their opinions. I don’t think status or income are important at all. Find what you want to do most and do it. In the end, I think that is what will bring you the most happiness in life. I just hope that my experience can give readers some insight on how to live their lives. Hidetoshi Matsubara was born in 1950 in Aomori. After graduating from Keio University Faculty of Letters with a Major in Asian History in 1974, he studied under falconer Asaji Kutsuzawa of Mamorikawa in Yamagata Prefecture. 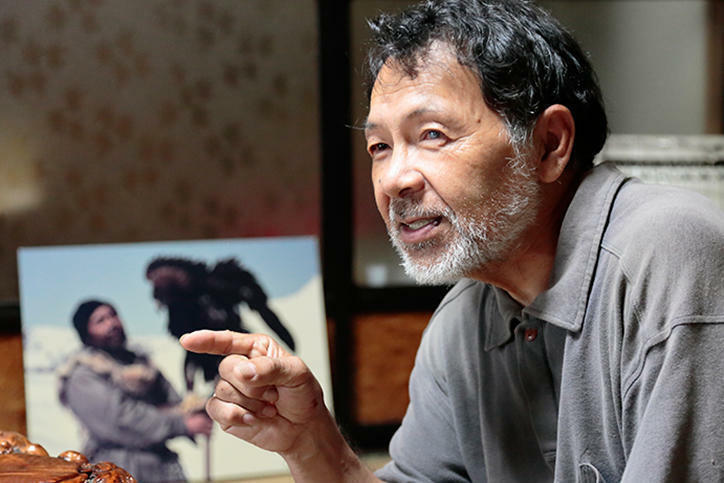 Today, Matsubara is the only living falconer who hunts with mountain hawk-eagles. 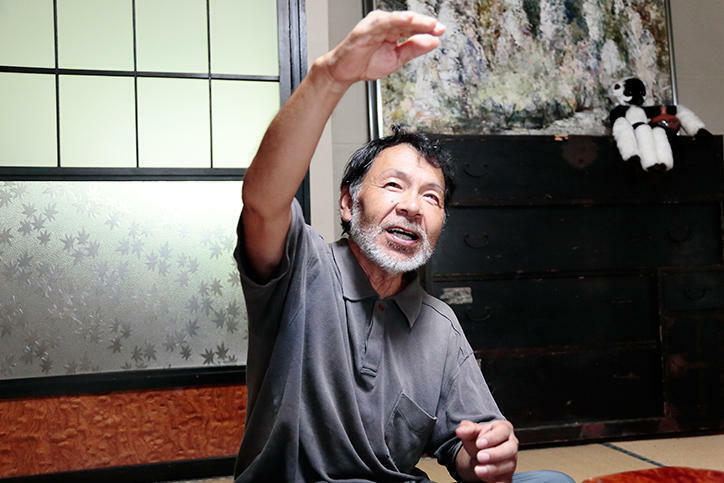 A proficient mountain climber, he has climbed most of Japan’s three-thousanders. In 1995 he was a member of the first group to ascend a remote peak located in the Kunlun Mountains in China and has completed solo climbs of four of Peru’s four-thousanders.